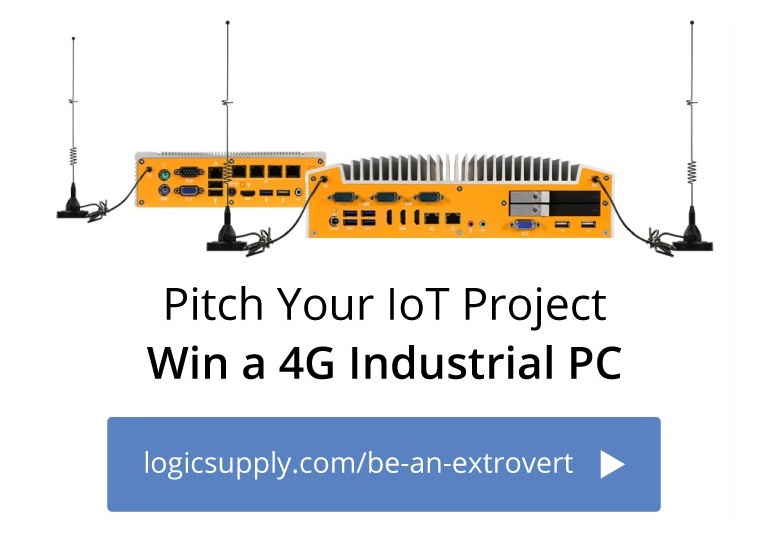 UPDATE 7/19/17: After reviewing entries from around the world, we’ve selected the IoT innovators who will receive free Logic Supply Extrovert 4G hardware. Meet the Be an Extrovert Winners here! Wireless connectivity is a vital part of today’s IoT landscape. We’re currently working with innovators in a wide range of industries who are developing revolutionary technology dependant on reliable data transfer via WiFi, wired connections and, increasingly, 4G LTE cellular networks. All of this led us to develop our Extrovert line of 4G LTE modems, which allows hardware users to easily connect to the 4G network without the need for tamper-prone dongles or the expense and time necessary for end device certification. Now we want to help empower device builders by offering a chance to win free prototyping hardware in our new Be an Extrovert contest. We’re looking for innovators developing solutions that utilize our customizable, ultra-reliable computers on the 4G LTE cellular network. We’re particularly interested in hearing from developers making waves in IoT, Digital Signage, Physical or Information Security, Building Automation, Manufacturing or Communications. To enter, tell us how you’ll utilize the 4G LTE network, why Logic Supply hardware makes the most sense for your application and how your idea will change your industry. How Does the Be An Extrovert Contest Work? For a chance to win free Extrovert-equipped prototyping hardware, simply visit www.logicsupply.com/be-an-extrovert and submit a detailed description of your hardware project. We’ll highlight several entries on our website and social media channels throughout the contest. Select submissions will move on to a qualification process during which we’ll contact you directly to further discuss what you’re working on. If your project is chosen as a winner, we’ll send you our Project Profile Questionnaire to help us build a full case study telling your story of innovation. Once the questionnaire is complete you’ll work directly with one of our hardware specialists to configure your free industrial PC. We’ll choose up to 5 winning projects to receive a custom-configured industrial computer, including Extrovert 4G LTE technology, valued at up to $2,000. If your entry is selected we’ll work with you to choose and configure your system, including CPU, memory, storage and I/O. You’ll have the opportunity to work with our Hardware Specialists to ensure that your chosen system is the perfect fit for your specific application. We’ll also work with you throughout the configuration and prototyping process to help promote your work and publicize the impact you’re making in your industry. The contest is underway and we’ll begin selecting winners in the coming weeks. For complete information read the full Be an Extrovert contest rules here or click below to submit your entry.